With development of favorable atmospheric conditions, the retreating monsoon also called as the North East Monsoon is expected to arrive soon over the peninsula. An area of low pressure has developed over Southern Bay of Bengal and is expected to usher in moist Easterly winds over the next several days. Numerical models expect this Easterly wave to persist through the week and bring in light to moderate showers over most parts of the state. Additionally, MJO a key atmospheric phenomenon is expected to turn favorable starting November providing an environment for additional precipitation. Chennai – Overcast with off and on thunderstorms. High of about 30 degrees and a low of about 27 degrees. Vellore – High of about 30 degrees with chance of scattered thunderstorms. Coimbatore – Sunny start to the day with a high of about 32 degrees. Chance of light showers developing late evening. 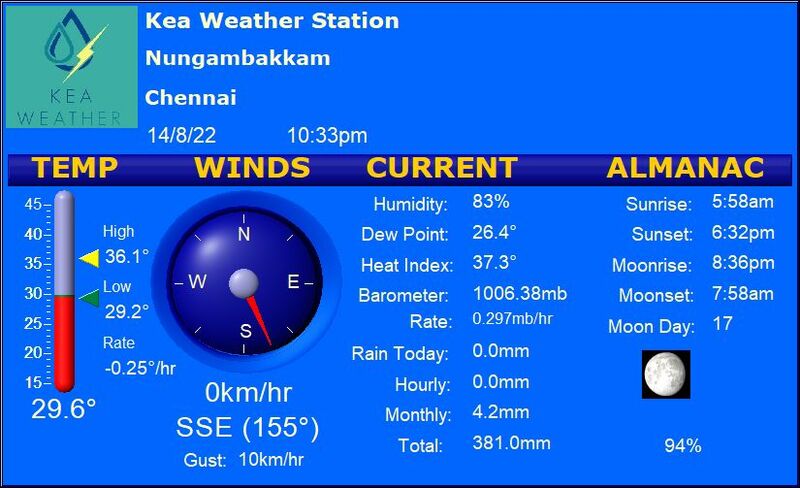 Madurai – Warm with a high of about 33 degrees and a low of about 25 degrees. Isolated thunderstorms are expected mainly after noon. Trichy – A bright morning with a high of about 32 degrees and a low of about 24 degrees. Chance of thunder showers in the evening.